This section will give you basic information about the violin, and we mean just the basics. Some of you might think this a bit technical but it is provided to give you an idea of how a violin makes a sound and why. First, we give you a description written by that 19th century expert on the orchestra, Hector Berlioz. It’s an excerpt from his Treatise on Orchestration. “Tender and slow melodies are never rendered better than by a mass of violins. Nothing can equal the stirring sweetness of some 20 E-strings vibrated by as many skilled bows. A minute movement of the arm, an unconscious impulse in the player, hardly noticeable with a single instrument, produce in a group the most wonderful shadings and arouse feelings which penetrate to the depth of the heart." 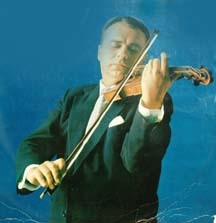 This is a picture of the great violinist Henryk Szeryng showng proper playing position. In its standard playing position, the violin is supported between tbe chin and left shoulder. The neck of the instrument is situated between the thumb and palm of the left hand, and the left elbow is held far to the right so that the fingers can fall almost perpendicularly on the strings. The bow is held between the fingers and thunb of the right hand. Varying pressure is applied to the bow by the index finger. Balance is achieved by the little finger. The hair of the bow is drawn at right angles to the string, about halfway between the bridge and the end of the fingerboard. To play high notes or to produce a louder, more brilliant tone the player bows the string closer to the bridge. To play softer tones, the strings are bowed closer to or even over the fingerboard. The strings of the violin were originally made of gut; however, refinements have been made and now the lowest string or G string is made of lamb gut wound with silver. The D and A strings are lamb gut wound with aluminum, and the highest string, the E string is plain steel. The stick is made of Pernambuco wood and has a slightly concave shape. The frog (the part you hold) is made of ebony, sometimes inlaid with mother-of-pearl. At the head, the hair passes through an ivory or metal plate. 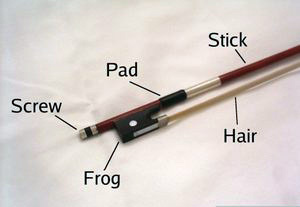 At the frog it passes through a metal ferrule to spread it in an even band. The hair is horsehair. The modern bow was created by Frangois Tourte around 1785 and has undergone little if any modification since. Before 1820, a violinist or violist supported the instrument against his arm, chest, or shoulder and placed his chin to the right or left of the tailpiece. In 1820, the German violin virtuoso Ludwig Spohr invented a chin rest which is attached just to the left side of the tailpiece. (Chin rest is not shown in diagram image.) The addition of this apparatus allowed the playeris left hand more freedom to move about above the fingerboard. Also known as colophane, this is a substance made from the distillation of oil of turpentine. It is rubbed onto the hair of the bow in order to increase the friction when the bow is drawn across the strings. Overall length: approximately 23 3/8 inches. 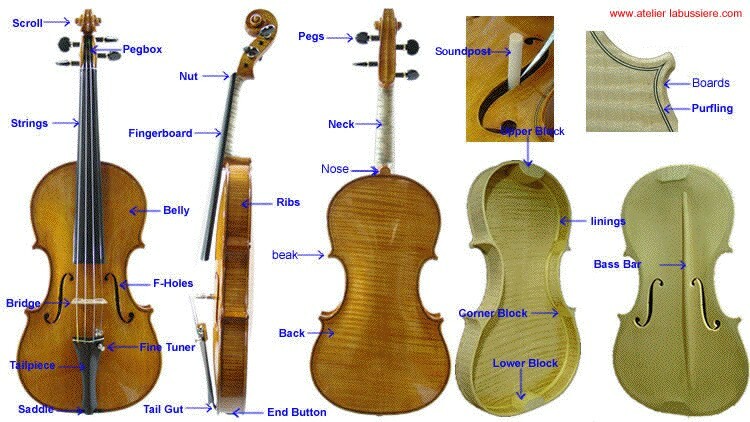 Here is an image (Courtesy of University of New South Wales, Australia) that should show you everything you need to know about the violin. Most of the terminology in these pages can be found on the image. The most interesting changes in the violin took place shortly before 1800. The shift to metal wound strings increased the tension on the neck. To compensate, the neck was angled away slightly from the body, a higher bridge was used, and larger sound posts and bass bars were inserted. Many of the great instruments by Stradivari, Guarneri orAmati were modified in this way so that today those instruments do not sound as they did when originally built. Howeverr some of these instruments that reside in museum collections are now being restored to their original state. The amount of sound produced by the string alone is quite minimal. The rest of the instrument serves as a mechanism for amplification of that tiny sound. To verify this fact, pluck a string on an unamplified electric guitar. The solid body of that instrument does not resonate, and thus without amplification the string is nearly inaudible. As the string vibrates, its energy is transmitted to the bridge, which in turn vibrates against the table. Note the position of the bass bar in relation to the foot of the bridge. The bass bar, transmission of vibration from the table to the back, placement of the soundpost is absolutely crucial for the best sound. Thus, the interior of the violin acts as a resonating body which amplifies the sound of the strings. Other factors which affect the overall sound are the condition of the wood and the size of the f-holes, which allow the sound of the instrument to escape. Here's a bit of the Meditation from Thais by Jules Massenet to show you how the solo violin sounds with otchestra. Listen! It got to a point where I had to get a haircut or a violin. The tail of the noble horse.